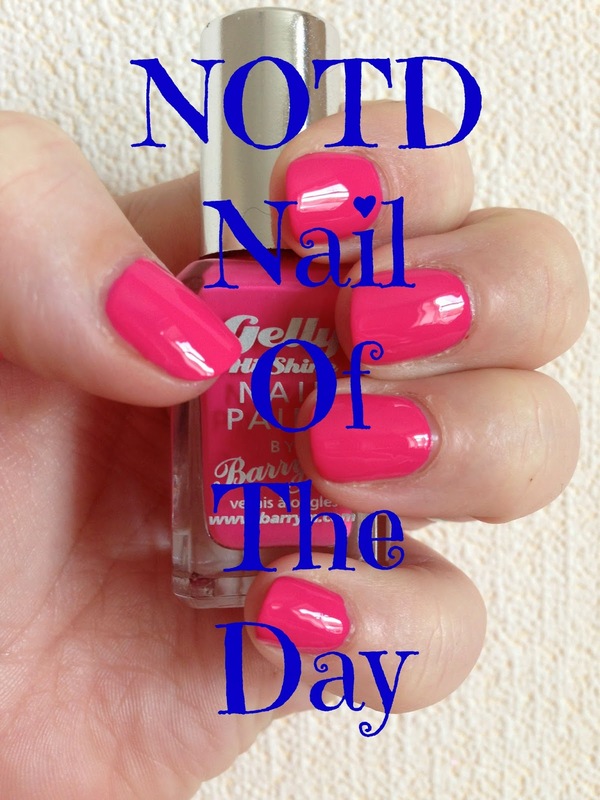 Today I have another NOTD post for you, today's NOTD is a lovely spring/summer colour and looks great as a pop of colour with a plain black or monochrome outfit or as an addition to any nice colourful outfit. The NOTD today is Barry M's Gelly Hi Shine in the shade Pink Punch, a lovely bright fuchsia pink colour, I love the colour range of Barry M nail polishes and the price is very affordable for such an amazing colour range, the gelly hi shine polishes are slightly more expensive than the original nail paints by Barry M (which are my favourite Barry M polishes) but they can often be found on offer on the high street. I did as always use my favourite base coat the Orly bonder base coat, available here and then I used 3 coats of the pink punch allowing each coat to dry fully in-between. I finished off with my favourite top coat, the orly glosser top coat available here. The polish looks lovely and glossy without the top coat but I find using the Orly top coat helps the polish to last longer on my nails, without it I only manage around 12 - 48 hours maximum out of a Barry M polish but with the top coat I get around 4 days from the polish so it is worth adding it for gloss and longevity. Pink Punch is a lovely shade and one that is perfect for the spring and summer months, like I said above it can be worn with many different outfit choices and looks amazing, I got a lot of compliments when I wore it. The polish is fairly easy to apply, the brush is quite thin but it applies well considering and drying time is average, I don't personally think the gelly hi shines look like a gel manicure, they do look more glossy with the Orly top coat but I don't find they look like gel, however the colour range is good and at only £3.99 you can afford to pick up more than one. I would say to give the Gelly Hi Shines a try if you've been wanting to but be aware that I always need 3 coats of the polish despite seeing claims on other blogs of them being a "1 coat" polish and they aren't very long lasting without a good top coat but for a night out or an occasion or if you change your nail polish regularly, they're reasonably priced and worth a try, I just don't find them to be worth the "blogger hype" they often get, but as I said worth a try as they're not terrible. I do have a review of 2 of the other shades in the range here if you'd like to read it. You can find the Barry M gelly hi shine polishes on line at Boots, Superdrug, Nailpolish.co.uk, Nail polish direct and The Barry M website. What's your favourite Barry M polish? Let me know in the comments.